Holy Communion is the Lord’s own institution whereby His people participate in the saving benefits of His body and blood (I Corinthians 9: 16). Regular observance of this sacrament is encouraged by scriptural precedent. We ordinarily observe the Lord’s Table on the first Sunday of each month. For monthly mediations on the Lord's Table to help reflect on and prepare for partaking, click here. 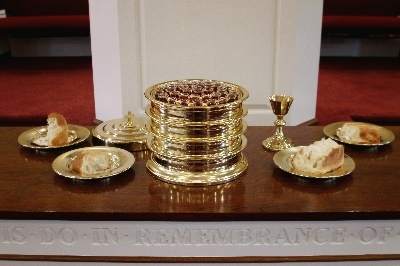 Every other month, Providence follows Communion with a Christian Love Feast reminiscent of the practice of the early church (I Corinthians 10:16). This potluck meal is a time to rejoice in our common salvation and to fellowship together as a church. Please see our calendar for the most updated schedule.